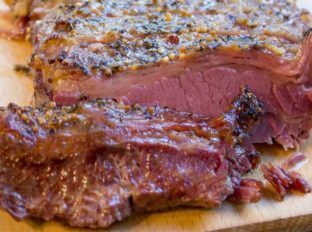 Crispy Slow Cooker Corned Beef with perfectly juicy slices of beef and crispy crust this is the only corned beef recipe you’ll ever use! 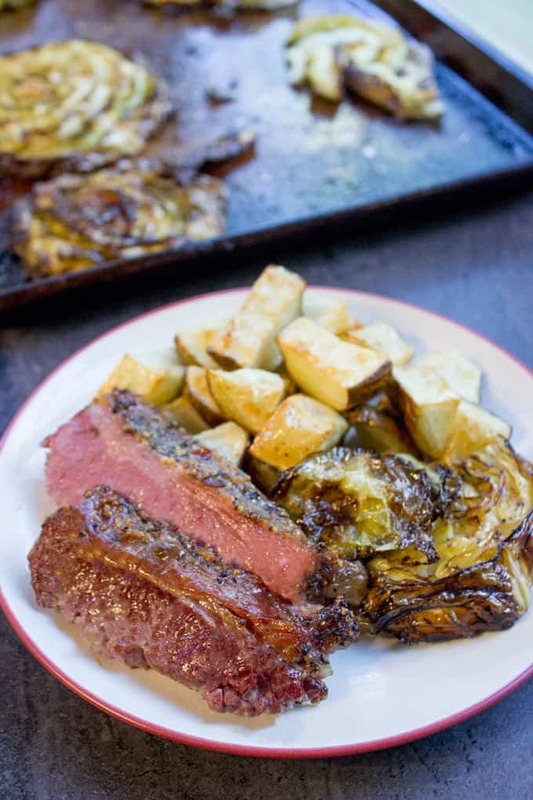 We’re getting all of our St. Patrick’s Day recipe ready to go, and this year we’re serving Roasted Cabbage Steaks (these are AMAZING as leftovers in my Cabbage Soup), Roasted Carrots, and Scalloped Potatoes and we’re using leftovers in our Corned Beef Hash! Crispy Slow Cooker Corned Beef has been a dish we make year round since we bought our deep freezer. Why you ask? Because since I had the ability to stock up during the “season” we now enjoy corned beef dinners and sandwiches all year long. You can serve this slow cooker version of this Irish-American classic with carrots, cabbage, or potatoes for St. Patrick’s Day. The magic of the Crispy Slow Cooker Corned Beef is in the liquids. I normally say don’t add any liquid, but in this case the vinegar and the bay leaf need a helping hand. The little bit of water you’re using is a vehicle for your bay leaf and vinegar to help flavor the meat. This recipe needs a total time of 9-10 hours, so I recommend setting this up in the crock pot in the morning if you’re having it for dinner that night. CAN YOU OVERCOOK CORNED BEEF IN A CROCK POT? It is definitely possible to overcook any beef in the crock pot, resulting in a cut of beef that is bordering too soft. This recipe calls for cooking on low for 9-10 hours. I would try to stick with this cooking time. I also like to keep the slow cooker on low so the brisket has more time to cook, making it tender and juicy. You could try cooking this for a shorter time on high if you’re pressed for time. DO YOU HAVE TO RINSE OFF CORNED BEEF BEFORE COOKING? You can rinse corned beef, but it’s not a requirement. Rinsing the brisket removes any excess salt from the meat, resulting in a more mild flavor. Or you can put the beef in the crock pot without rinsing at all. WHICH CUT OF CORNED BEEF IS MORE TENDER? You can buy pre-brined corned beef, or get a brisket and add the seasoning to the corned beef yourself. I like to go with a round cut of brisket in the slow cooker, because it holds its shape better than a point cut and shrinks less in the pot, which is better if you have people over for St. Patricks day. But due to the point cut having more fat, it can turn out more tender than round cut. It’s a personal choice, because in the end both are used for this dish. HOW DO YOU KNOW WHEN CORNED BEEF IS DONE? For food safety, you want to make sure your beef is cooked to at least 145 degrees F. Use a meat thermometer to check the temperature. There shouldn’t be an issue if you cook the beef for the entire time. HOW DO YOU STORE CORNED BEEF? You can store leftover crock pot corned beef in the refrigerator in an airtight container for 2-3 days. Honestly, this usually doesn’t last past the second day at my house. You can also freeze your beef brisket with your favorite cabbage recipe for several months. You can fill the slow cooker up with water for a more traditional corned beef, but keep in mine that the texture of the dish will not get crispy if it’s completely covered in liquid. You can add cabbage, sliced carrots, onions, and potatoes to the slow cooker when there’s about 2 hours left in the cooking time. The liquid from the corned beef will add a ton of flavor to the vegetables. This may look like a lot of spices, but crock pot corned beef gets its signature flavor from this so don’t worry, go ahead and use the seasoning packet as direction on your beef brisket. If your corned beef or beef brisket is too fatty, you can cut some of it off before placing in the crock pot. But leave a little bit, as this adds a lot of flavor to the dish. 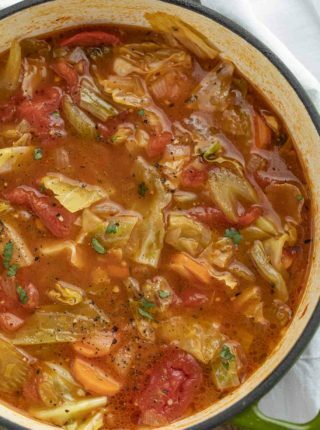 If you need more cabbage recipes try my Stuffed Cabbage Casserole, or Stuffed Cabbage Sloppy Joes! Or mix shredded cabbage together with mashed potatoes for a basic colcannon. In the morning shred leftover beef together with cabbage and potatoes to make Corned Beef Hash. I don’t recommend using the leftover drippings from the beef brisket in the slow cooker for any kind of gravy, because it will be really salty. Cooking bland vegetables, like potatoes, carrots, and cabbage, work well with this water because it will season them. Add some more flavor with allspice or celery. 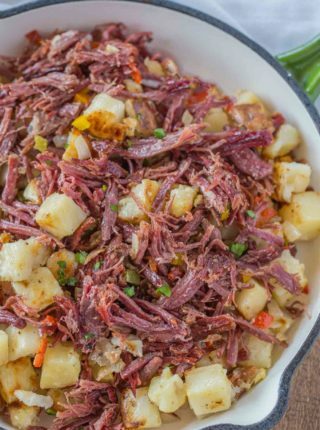 Serve your slow cooker corned beef recipe with horseradish or dijon mustard (you can also roast potatoes with dijon like these Dijon Roasted Potatoes) on St. Patrick’s Day! My New Slow Cooker: For larger roasts I also brown the meat in the insert and not lose a bunch of the flavor by transferring the meat and leaving the browned bits behind. If you’re thinking of a new slow cooker, consider it if your budget is more open. You can mix together mustard seeds, bay leaves, allspice berries, salt and pepper. Enjoy! I’ve never heard of the the packets either. I’m vegetarian but I am cooking for a friend. so I won’t be able to taste test. Can you give me the measurements I should use for each of mustard seed, allspice, bay leaf, salt and pepper? It would be greatly appreciated!! The texture was melt-in-your-mouth perfect but it was so salty it was almost inedible. The instructions say “You can rinse corned beef, but it’s not a requirement. Rinsing the brisket removes any excess salt from the meat, resulting in a more mild flavor. Or you can put the beef in the crock pot without rinsing at all.” I rinsed it, and can’t imagine the salt level if I hadn’t! I’m surprised no one else has complained about the saltiness of this recipe. I’ve since looked around for a “not to salty” slow cooker corned beef recipe and they recommend covering the meat all the way and then switching out the liquids part of the way into it, to help leach out the salt. Next time I’ll try that, and maybe not cover it all the way with the second batch of liquid to get it to a little crispy, but something needs to be done about the saltiness. Oh no, it sounds like your was pumped full of salt. Glad everyone still enjoyed it. Seven hours in (to a total nine hour cook time) I lifted the beef out and added potatoes and carrots to the crockpot. Put the beef back on top and added more liquid. Fifteen minutes before serving I threw in the coarse chopped cabbage. Man, oh man, I will never cook my home-cured corned beef any other way! Thanks for sharing your tasty recipe! I’m so glad you loved it! I really appreciate the 5 stars. Super! First time without my pressure cooker and it is delicious. I’m about to turn 83 years old and just learning to use my slo-cooker! How awesome! I’m so glad you decided to give it a try. Thanks for the 5 stars. I forgot to add that I tucked carrots around the sides of the corned beef. When the meat and carrots were done I set the crockpot on warm and added some of the water from the crockpot to water in a saucepan and cooked some potatoes and cabbage. Everything was wonderful. I made this yesterday for St. Patrick’s Day. It was delicious! My husband just said that if corned beef is still on sale we should get more and freeze it so that we can have this again soon. 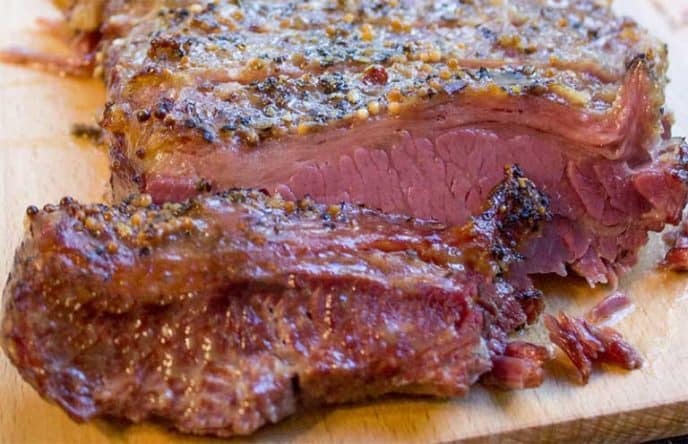 Thank you for sharing this easiest but the BESTEST slow cooker Corned Beef recipe!!!! It was SOOOOO GOOOOOD!!!!! 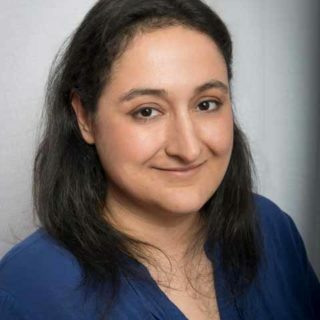 We are having such a happy debating; Ruben sandwich OR Corned beef hash tonight with left over 🙂 Sabrina, your recipes NEVER disappoint me and you really teach me how to use crock pot, foodie way!!! You really can’t go wrong either way! I’m so glad you’re loving all of the recipes. WAY TOO SALTY!!!!!!!! I WILL NEVER MAKE THI RECIPE GAIN. HOWEVER, I MADE THE CABBAGE STEAK REIOE AND THAT WAS FANTASTIC!!! Oh no! Next time you can rinse your corned beef to remove any excess salt from it. I’m glad you enjoyed the cabbage steaks though. This was my first time making this recipe and I will make it again. It is easy and delicious. So good. I was out of fresh garlic, so I used garlic powder I added a bit because when I’m not using fresh the flavor doesn’t have as much kick. 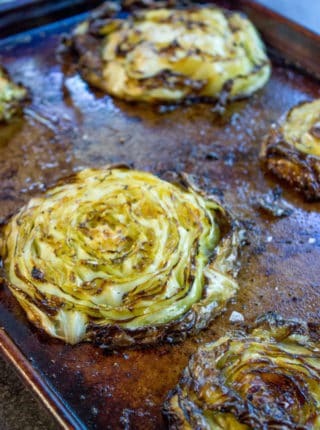 We tossed in cabbage and onions at the two hours left point and they were delicious. I served with mashed potatoes and herb glazed carrots. My family loves this recipe, but we find the cook time inaccurate. I just made a 3.5 lb brisket that got to 135 in under 3 hours. We always crisp under the broiler. Are you supposed to keep the lid off the cooker? I’m so glad you enjoyed it! Sounds like your slow cooker runs warmer than mine but so glad you checked it. The lid is supposed to be left on while in the slow cooker. Made this yesterday for St Patrick’s Day. It was amazing. Guests kept coming back for more. This recipe is a keeper! Sabrina – banging! This was simply the best corned beef I have ever made. And what could be better than a day of letting the crock pot do the work. This is a keeper! I made this for st.patricks and it was the best I’ve ever made. I wanted a recipe that just didnt dump meat and veggies in the crock pot. The roasted potatoes and roasted cabbage steaks went beautifully with the beef. I did add carrots to the last 2 hours of cooking. Mmmm will make this recipe again & again. I’m so happy you enjoyed it, Linda! Thanks so much for the 5 stars. Really easy recipe and I think it’s the best/tastiest corned beef I ever made. I used Guinness instead of water. I also served a mustard sauce that everyone liked. Sounds amazing! So glad you enjoyed it. If adding the veggies for final two hours, do you just toss them all on top/around the meat? Edit * I found your response in comments thanks! Can you clarify this statement, “…add just enough water to come up about 25% of the way to the top of the meat” , for me? For example, a 2 inch thick corn beef brisket, is 25% of the meat submerged or 75% of the meat submerged? This was the best corned beef we’ve ever had. I followed the recipe and directions exactly. It was so hard to stop nibbling at! Thank you for this keeper recipe. I’m so glad you enjoyed it, Becky! Thanks for the 5 stars. This looks amazing! About how long should I cook a 4.5 lb corned beef flat brisket on low in slow cooker? Thank you! Probably need about 9-10 hours on low. I hope you enjoy it! I have a 5.5 lb corned beef. I want to cook it my slow cooker on low. When should I put it in and how long should I cook it. I would recommend cooking it on low 9-10 hours. Any suggestion on converting this recipe to an instant pot? I’ve never tested it before so I’m not comfortable giving a recommendation. I’m sure you could find an instant pot online recipe using similar ingredients to follow as a guideline. Sorry. Did you use brown sugar or white sugar? Made this crispy corned beef with a 3.5 lb flat cut, and followed recipe to the letter with exception of cooking an hour longer. It was fantastic, and the best I’ve ever had. The topping on the corned beef made the dish exceptional. Thanks for the recipe! 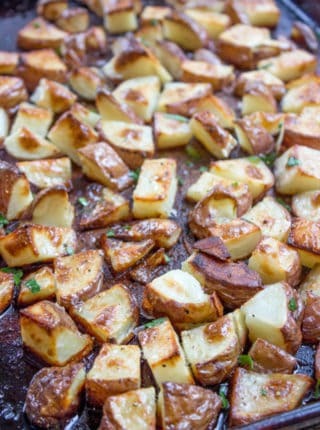 This looks amazing as I love the idea of a crispy crust and want to make. The size of my brisket is just over 7 lbs. Can I just double the ingredients? Assume cooking time would be longer? I need to cut meat in half? I would recommend cutting it in half as it would probably be too big for your slow cooker and not cook thoroughly. Enjoy! I’m French and i’m sorry for my english ! I would like to do your corned beef recipe, it looks so DELICIOUS !!! I have all the ingredients but I don’t see if i can add salt ? No need to add any salt. The brisket already has salt in it. I hope you enjoy it! This was the best corned beef I have ever had ` tender and tasty. Made the slow cooker corned beef and it was out-of-this-world delicious!!!!! It’s a keeper!!!! 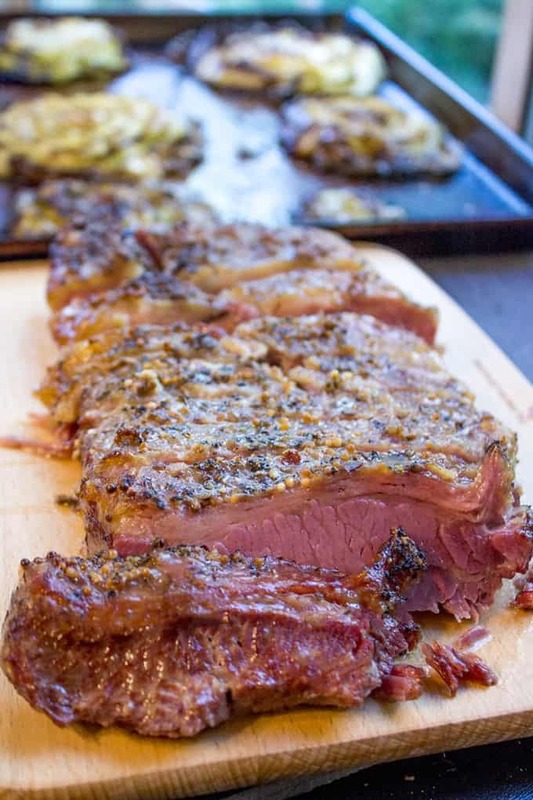 Are you using brisket or corned beef in this recipe? If brisket, does it need to be brined before? If so what brining method do you use? I used corned beef for this recipe. I have always used a recipe that calls for apple cider, or apple juice, rather than water. Can I still do that in this recipe? Also, may I use light brown sugar, rather than white sugar? Excellent corned beef! Had to take away and refrigerate a portion in order to have enough to make Reuben sandwiches for tomorrow or my husband would have eaten it all! Will definitely make again. Thanks for sharing! Haha, it’s hard to pull me away from it too! Looks delicious! I am trying this recipe today! Is there a substitute for the bay leaf? Will it be okay without? You can use dried thyme or oregano as a substitute. Enjoy! This looks so good! I am a meat eater & it needs to be very tender. Can you rub on the seasoning & let the corned beef or brisket marinate in the refridgerator for a few hours or overnight? Thanks! I made this last year and I will never go back to boiling! Fantastic! I had always wondered how some of the famous New York delis got such juicy, tender, flavorful corned beef. Thank you for sharing! 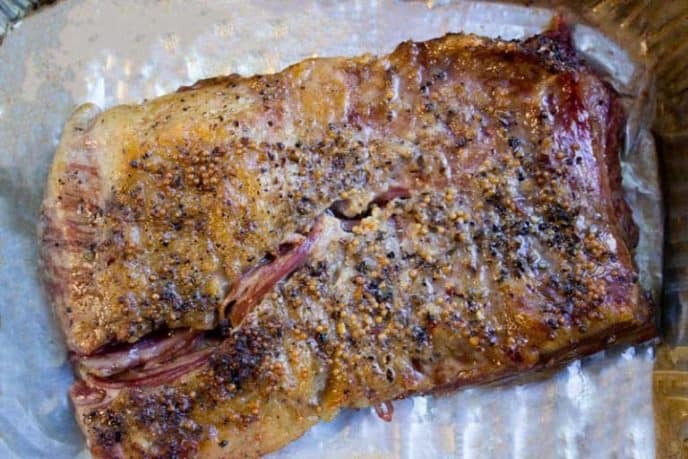 Have you tried this method with regular (un-corned) beef brisket? I’d love to hear your seasoning recommendations. Would you still use vinegar? This is the best corn beef that I have EVER ate! I sauteed Thailand cabbage with white onion and had that on the side with white rice. It tasted so good that my daughter and son-in-law called me back later that night and asked for corn beef and cabbage next week. I will be preparing this corn beef again and yes, I slow cooked it for 9 hours. What a tender and succulent piece of meat! Yum! Looks tasty. One question; does “just enough water to come up about 25% of the way to the top of the meat” mean the liquid level is 25% above the bottom of the crock pot or 25% below the top of the meat? In other words, should about 75% of the side of the beef be above the liquid? Or only the upper 25% is above the liquid. Thanks. 75% of the meat will be above the liquid. Hope this helps to clarify. Enjoy! Hi! I have made my corned beef in the slow cooker for several years now. However, instead of water, I have used apple cider or apple juice. Could I still do that in this recipe? I’m also wondering if that would omit adding the vinegar. I’ve honestly never heard of crispy corned beef! I am dying to try it! Of course but just know that it will produce a sweeter taste. I hope you enjoy it! +Why can we not print this recipe? I just tested the print button on the recipe card and it works fine on my end. Maybe it was a glitch. Sorry about that. Been looking for a really good corned beef slow cooked recipe.. BAM. I found it. The best corned beef ever. Made sandwiches. THEN I made a Shepard’s pie with some corned beef. Amazing. Topped with garlic mashed potatoes. To die for. Took your advice, bought a few (4) extra. Thanks for the ultimate corned beef slow cooked recipe. Wow, that’s a huge compliment! Thank you so much! I just want to let you know I love this recipe. Although, we use beer instead of water. NEVER thought I could get a crispy corned beef out of a crock pot but I did w/this recipe. I cooked on low for just over 10 hours and didn’t need to broil it. I substituted honey for sugar and all was good (as I suspected it would be). Would DEFINITELY make again! So glad you took a chance and decided to try! Delicious! This so the best corned beef I ever made. My family loved it. So easy too. Sounds a winner to me, Tara! Thanks for the 5 stars. What just happened in my kitchen? WOW. This recipe was great, to say the least. Thank you! What an awesome way to ring in the New Year with my kitchen smelling so good. I think a tradition has just begun. Today, leftovers made yummy sandwiches! This is the best I’ve had. The fat was crisp and the meat was juicy. I will never make it another way. Oh and the crispy cabbage was bomb!! Made it tonight and not a bit was leftover. Sounds like a winner to me! So glad you enjoyed it! Is this done with thawed corned beef? Or could I do it frozen? Needs to be 100% thawed. What if I don’t have apple cider vinegar? Can I substitute something else? I haven’t tested them using this recipe but most of the time you can substitute with lemon or lime juice. You can also try white wine but you’ll want to double it. Let me know if you decide to try something different and how it turned out. Good luck! Looks yummy! I want to try this but it’s my first time. So I would be buying ready to cook corned beef that’s vacummed sealed with brine? Love this dish. Made it multiple times and its been amazing each time! Quick question tho… can you trim off some of the fat before adding the brisket to the slow cooker? Or will it become to dry? I would leave it as it adds to the flavor while cooking down. I’m so glad to hear you loved it!! So glad you enjoyed it Dawn! Thanks for the 5 stars!